VANCOUVER, BC--(Marketwired - December 01, 2016) - SYSPRO, a provider of award-winning, best-of-breed Enterprise Resource Planning (ERP) software solution for on-premise and cloud-based utilization, today announced that it will be conducting the second session in a special, 2-part webinar series, geared towards Canadian manufacturers, on the topic of Exporting to the U.S. on Tuesday, December 6, 2016 at 10:00 A.M. PT / 1:00 P.M. ET. Part two of the series, "Exporting to the U.S. -- Mitigating Harmful Risks for Canadian Manufacturers" will explore the potential risks Canadian manufacturers must consider, when exporting to the U.S. The first session in the webinar series, "Exporting to the U.S. -- Key Strategies for Canadian Export Readiness," explored insights into how Canadian manufacturers who are considering exporting to the U.S. can devise a successful strategy to become export-ready. View the recorded webinar here. The webinar on December 6th, will feature leading industry experts Dave Cavan, Regional Sales Manager for SYSPRO Canada, and Grant Thornton's Dan Lundenberg, Partner, National Leader -- U.S. Corporate Tax Services, and Brad Rolph, Partner, Tax Service Line Leader for Southern Ontario & National Transfer Pricing Leader who will share their deep industry insights into mitigating potentially harmful risks to your business, as part of your export strategy to the U.S. The United States and Canada have a unique and symbiotic relationship. Canada's rapport with its largest neighbor to the south has been built on a solid, historic foundation of proximity, accessibility, cultural and language familiarity, and lucrative trade benefits due to flexible borders. Canada is the United States' largest trade partner, and the economic climate between the two countries is robust and expanding. It therefore seems like a natural fit for Canadian manufacturers to look to the U.S. for expanding their revenue growth -- beyond Canadian borders. Although the business benefits of exporting to the U.S. seem to far outweigh any investment or preparation costs, exporting to any new market unleashes the potential for harmful risks. Many manufacturing executives are not even aware of the hazards, nor do they understand the often expensive and non-recoverable implications of things "done wrong." Being informed and prepared for the critical factors before entering the U.S. market, is the first line of defense for business leaders -- and can save them both time and money. "When we look at the reasons why so many small and medium-sized Canadian manufacturers are not exporting to the U.S., we seem to consistently return to a simple, but important estimation of risk," according to Dave Cavan, Regional Sales Manager for SYSPRO Canada. "If Canadian manufacturers took the effort to adequately prepare their expansion strategy with due diligence and research, they could mitigate risk and reap financial reward. Failing to implement a sound U.S. expansion strategy that covers managing risk could cost Canadian manufacturers dearly in the end." 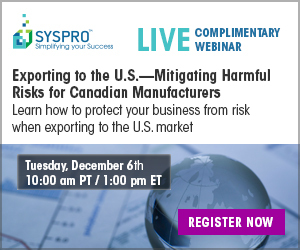 Learn how Canadian manufacturing leaders can protect their businesses from risk when exporting to the U.S. market.